The river, the coast, the scenery, the food, the fun - Dartmouth has it all! Spacious, luxurious and well appointed, the apartment combines contemporary style with original features, and local art. The South Devon Coast Path runs past the pottery, taking you to remote coves and windswept cliffs. 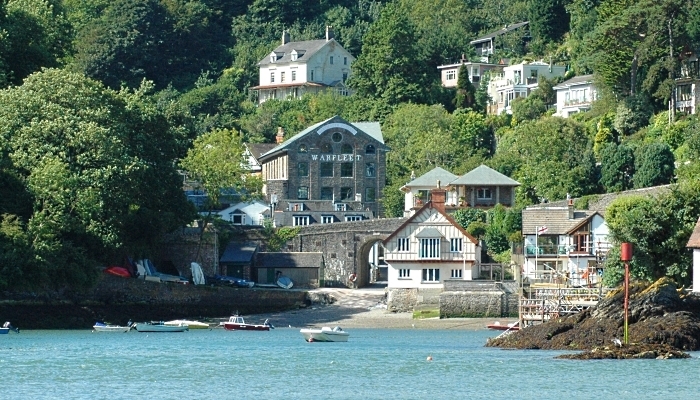 Dartmouth has more than its share of fine restaurants and pubs - entertainment all year round. Head for Dartmoor for dramatic landscapes, challenging walks, cosy pubs, scenic drives and wild ponies. ... or just relax in style and comfort. Browsing galleries and craft shops…. Taking a bracing cliff-top walk…. Sheltering in a cosy pub…. Taking a boat up the river…. Absorbing local history and National Trust properties…. Chilling out with a book…. Helping the kids catch crabs…. Dining out on top class seafood or local game…. A romantic stroll along the waterfront or the beach…. …. Choose the combination that suits you, all with the comfort and flexibility of a luxury self-catering apartment at Dartmouth Pottery! This local landmark building has recently been renovated to the highest standard, and this large spacious apartment has a 5 Star Visit rating. The fantastic secluded location on Warfleet creek is only 10 minutes walk from The Castle and the South West Coast Path, and a pleasant 15 minutes from Dartmouth town, so you can have the best of all worlds. – Large open-plan living room, WiFi, TV, Sky box, DVD player, HiFi. – Fully-equipped kitchen and 6-seater dining area. – Contemporary style, with original features and local artwork.